His art is as iconic as his name: Andy Warhol. Warhol created art out of the ordinary, like a can of soup, and art with the ordinary, like the humble Polaroid camera. Hundreds of his snapshots will be on display this month through Sept. 19 at the Weatherspoon Art Museum as part of the exhibit “Big Shots: Andy Warhol Polaroids”. The show features approximately 300 Polaroids and 70 gelatin silver black-and-white prints pooled from the many donated to the Weatherspoon Art Museum, Duke University’s Nasher Museum of Art and UNC Chapel Hill’s Ackland Art Museum in 2008 by the Andy Warhol Photographic Legacy Program, a division of the Andy Warhol Foundation. Warhol was one of the first artists to embrace Polaroids. The exhibition, a first-time collaboration between the three university art museums, will feature the models, actors, sports heroes and socialites who populated Warhol’s world. 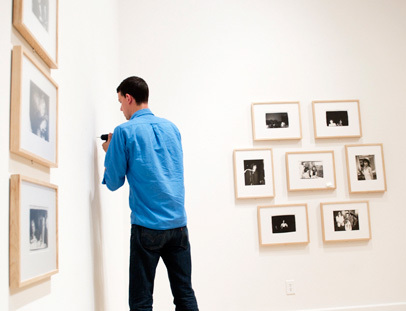 Warhol’s photographs offer viewers insight into his working method as well, Gustafson added. He’d photograph people when he was commissioned to do their portraits, sometimes adding white powder to his subjects to make their bone structure more prominent, she said. A variety of programming is planned around the event, including a documentary film series exploring the rock music created in the 1970s and 1980s, during the height of Warhol’s popularity. Visit the Weatherspoon Art Museum’s Calendar of Events for all programming related to the Warhol exhibition.